Las Vegas is more than showgirls, gambling, and glitz. Who would have “thunk” it? Las Vegans actually read! 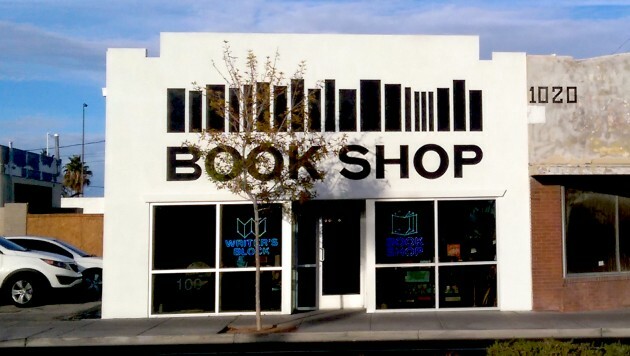 And now, besides having several used bookstores and more than one location of a big-named retailer, a new and unique independent bookstore, the Writer’s Block, has appeared on the scene. Tony Hsieh, president of Zappos, donated 350 million dollars to rebuild downtown Las Vegas. The Writer’s Block was one of the businesses selected for financial assistance. Drew Cohen and Scott Seeley, co-owners, opened the Writer’s Block at 1020 Freemont Street in downtown Las Vegas the end of November 2014. Cohen, the book buyer, has done a fabulous job filling the shelves. There is a selection of every reading genre under the Vegas sun. Fiction emphasis is on classics and contemporary literature that are sought after, surprisingly, by sixteen to forty year olds. It’s encouraging to find they still prefer reading the printed page as opposed to their Kindle. According to Cohen, one-fifth of the store’s customers are tourists who have grown tired of the slots. I’m sure when they first entered the store they were in wonderment, just as I was. The store’s unassuming plain white structure doesn’t begin to hint at the treasures inside. Walking through the door, I was met with not only a trove of well-curated books on all sides, but also, colorful kites, small Mexican masks, and puppets hanging from the beams. Bird lovers will delight in their artificial feathered friends perched overhead. For five dollars, customers can buy birds with assigned names and bios written by Chris Molnar, store manager. Hanging throughout the store are T-shirts with nouns to describe the wearer: Poet, Outlaw, Dreamer, etc. Small adjective pins costing a dollar add to the titles. Midst board games and unusual trinkets from other countries, I was thrilled to find the newest rage—adult coloring books intermingled with those for children. At the back of the main room, I discovered the children’s corner where young readers can sit among their own literature. Adding brightness to the area are rainbow-hued, stuffed-leather otters parading overhead. Besides books, diorama kits entice along with all the accouterments—background cards, various animals and people, and other accessories to pick from in order to build, design, and personalize the miniatures. On the opposite side of the room, a cage houses the Baron, a brown and white rescue bunny. He will be part of upcoming school field trips. At night, he is given the run of Codex. 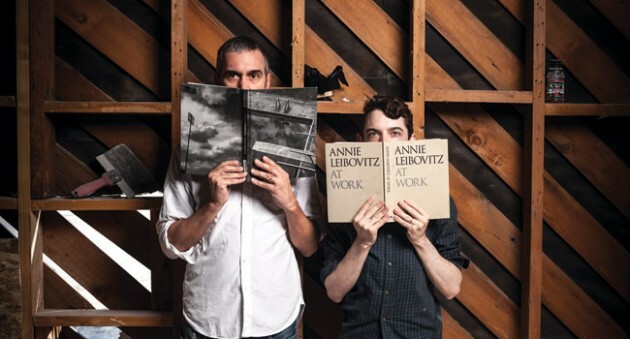 Writers Block co-owners (l-r) Scott Seeley and Drew Cohen. What is Codex? It is a room where valley children ages five to eighteen enjoy free writing workshops. Seeley was co-founder and former director of 826NYC, a free writing program for students in Brooklyn. There, the program was set in a superhero store where participants entered through a secret door behind a bookcase. Seeley has brought a similar scenario to the Writer’s Block by creating a passageway of mystery when one walks from the store’s main room through a dimly-lighted forest into Codex. Seeley and Cohen like change, so next year the leafy greenery will be gone. The staff is toying with the idea of snow for the new walk-through. Emerging from the foliage, one enters a large room with tables and desks. The room can be sectioned off with movable walls or kept as a large one. Children’s classes range from three weeks to a month. Younger children mostly do craft-like projects. Recently, classes made pinhole cameras, but they have also written a book of poetry featuring such subjects as animals and what a marshmallow feels like. Other students have written words and set them to music, then recorded the song across the street at National Southwestern, a recording studio. Screenplays written by another group will be made into short films by UNLV film students. Codex teachers are enthusiastic volunteers consisting of UNLV graduates, professionals such as musicians, etc., and, of course, bookstore staff. Codex is a place for adults, too. The room hosts book signings, readings, writers’ meetings, book discussion groups, and even trivia nights. Present book signings are those of local authors whose indie and self-published books are showcased each month in the store. Cohen says he is working to obtain signings of well-known fiction writers for next year. There are two book discussions groups that meet on alternate months. 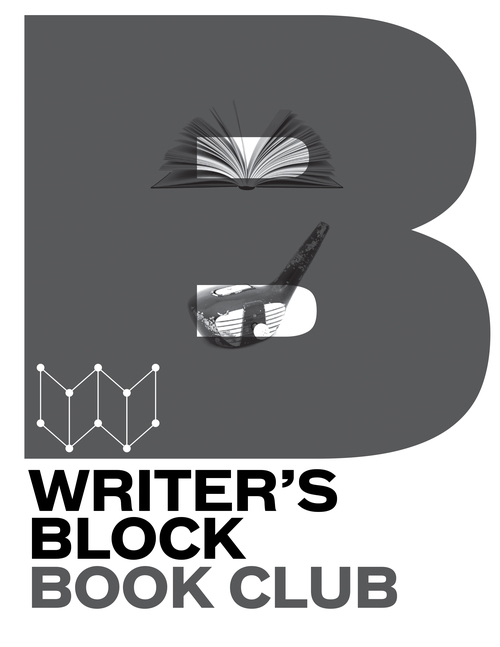 The Writer’s Block Book Club is chaired by Cohen and Jamison Crabtree, newly hired program director who is also a poet, published author, and teacher at UNLV. The book read in August was DJuna Barnes’ Nightwood. The Bourbon Book Club, headed by Crabtree, Seeley, and Molnar, is in conjunction with the Whiskey Attic of Las Vegas. These book discussions are paired with a whiskey. A French bourbon was tasted during September’s discussion of James Salter’s A Sport and a Pastime. The first Book-Ko Literary Trivia Night, scheduled for every other month, was held in August with about twenty-five people attending. Some questions, during the nine rounds, after participants watched movie clips and heard audios of novels’ first lines, were the book titles the lines came from. The winner received a store gift certificate. All other participants were awarded a literary-themed wall clock. It seems no one leaves the store empty-handed. Upholding Seeley’s desire to be not only an independent bookstore and literacy educator but also a publisher, the store boasts an all-purpose letter press which, in addition to paper, can press intaglio and bind. Down the street, the store has access to an Espresso Book Machine, which will shortly be moved to the Writer’s Block. The Espresso is a print-on-demand machine and binds from a PDF file. 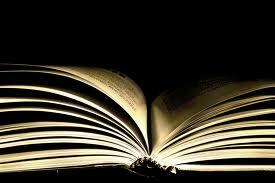 One book can be printed in five minutes for a cost of eight dollars. Colored book covers can be printed, but the machine is not good for books with interior photography. Workshop participants’ writings are printed and bound here to be taken home. The showpiece of the Writer’s Block is a donated 1890 Chandler and Price Letterpress. It sits in the front window and is presently being restored. This letterpress, built in Ohio, was the workhorse of the printing industry for eighty-three years. 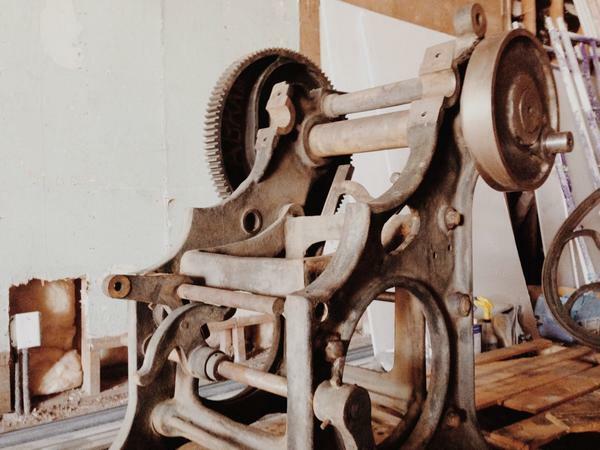 Once restored, the machine will be used for in-house fun projects such as broad sheets for the store, although, at a later date, there may be a class to teach adults how to operate it. Whether you are a reader or not, you’ll lose track of time at the Writer’s Block. It’s guaranteed. Before I knew it, I had spent a magical hour engrossed in the books and fun items scattered throughout the store. 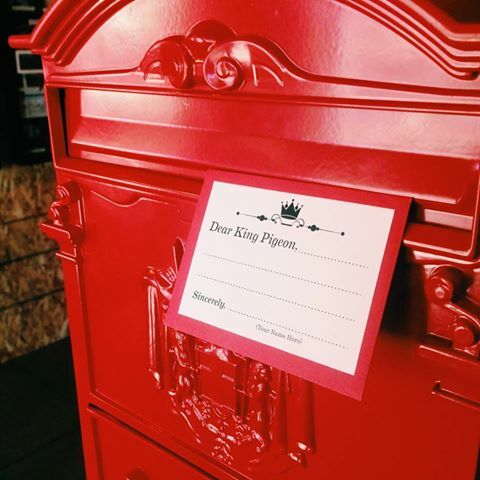 When I was ready to leave, I spotted a red English post box with a sign saying that for a quarter I could “Ask the King Pigeon” life’s biggest questions, such as, “Why am I here?” It will take a week for the pigeon to answer the question I posed. So, when I return for my response I will, I’m sure, once again, be amazed at all the wonderful new books and products Seeley and Cohen continue to stock in this desert gem. What would you ask the King Pigeon if you had the chance? I will select the best question posed, put it in his mailbox, and announce the winner and the answer once the King replies. This entry was posted in Brick & Mortar Bookstores and tagged 826NYC, Book buyers and bookstore selections, Bookstore pets, Bookstores and book signings, Bookstores and non-book items, Bookstores and writing programs, Bookstores host book clubs, Drew Cohen and Scott Seeley, Espresso Book Machine, Independent bookstores and how to thrive, Las Vegas and alternate entertainment to gambling, Letterpress Machines, POD books, Print books vs. e-readers, The Writer's Block Las Vegas, Tony Hsieh and Las Vegas revitalization. Bookmark the permalink. Always good to find a new old style bookstore. two thumbs up. It’s a great place, Rona. If you’re ever in Vegas you should visit it. OK, here’s my question for King Pigeon (it may take him more than a week to find the answer): What is the solution to world peace? Thanks, Christina for the question. After I gather everyone’s questions (hopefully there will be more), I will visit King Pigeon with the questions and return to the Writers Block to retrieve them after he answers. What is the most important thing to UNlearn? Thanks, Ann for your question. We’ll see what King Pigeon says. instead of leaving it out for me. I’m rethinking my question. I don’t want KP’s brain to explode trying to answer it. Try this instead: If Chaucer had finished The Canterbury Tales, which pilgrim do you think would have won the storytelling contest, based on the pilgrims’ profiles and the tales he did complete.? Okay, the question has been changed. Your answer from King Pigeon, Chris. a crafty bird deserves to win it. Nice post, Sue. You are correct – ‘The Writer’s Block’ is a great store. Certainly something for every book lover. A real potpourri. Thanks, Stephen. I know you enjoy the store as much as I do. What a store. So well-described. If I were a betting woman, would put my money on this shop. I work for an indie bookstore in Atlanta. Will share some of these ideas with the boss. My question: Who put the bop in the bop shoo bop shoo bop? Thanks, Eve. Writers Block is a great place. You question is duly noted. Your answer, Eve. from King Pigeon. Wow! Adding this to my bucket list. Also – I WANT one in or around Atlanta!!!! Anybody up for a business venture? It really is a wow, Janet. Scott and Drew have done a super job with the store. Late to read this, but sounds like a bookstore destined to become an icon of Las Vegas. On my bucket list… thinking of my question….